Home » Heart Health » Shoulder Pain and Heart Attacks: Are They Connected? It seems like every year we get a little closer to understanding heart attacks better and better, especially possible symptoms. That’s good because the sooner we can recognize the signs of a heart attack, the quicker we can respond with the correct treatment. Recently, it’s been theorized that there is a connection between shoulder pain and heart attacks, specifically left shoulder pain and heart attacks. If that’s the case, how are they connected? Why are they connected? In this article, we’ll take a look at of how exactly heart attacks and shoulder pain can be connected, the symptoms you should watch out for, and how to know the difference between a muscle spasm and the sign that you are having a heart attack. A Connection between Shoulder Pain and Heart Attacks? So let’s start with the most basic of questions regarding the subject. Is there a connection between shoulder pain and heart attacks? The answer is a definite maybe. For years, we’ve known about the connection between left arm pain and heart attacks, but according to researchers at the University of Utah, there is a solid chance that left shoulder pain is connected, too. According to their study, the University of Utah says that the more of the risk factors you have for a heart attack, the more likely you are to have severe shoulder problems. The university used 36 participants in their study with higher heart attack risk factors that were 4.6 times more likely to have shoulder issues than those in the study who did not have those same risk factors. These same subjects were also six times as likely to rotator cuff injuries. The researchers also found that the amount of strain placed on the shoulder didn’t seem to be a significant factor as the heart health issues were. Now that we’ve detailed the possible connection between left shoulder pain and heart attacks, it’s time to go over the symptoms that can accompany heart attacks and shoulder pain. Now that you know that there is a possibility of heart attacks being connected with shoulder injuries, you may be wondering what symptoms you should be looking out for. 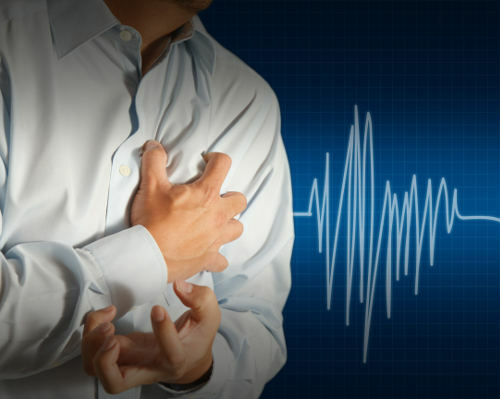 Fortunately, the work of many doctors and scientists over the years have found a number of heart attack symptoms you should pay attention to. One of the most common symptoms of a heart attack is a tightness or squeezing pain. This is usually felt in your chest but can also be felt in your left arm and radiate into your shoulders and back. Stabbing pains towards the center of the chest are also a good indicator of a heart attack. This may be by themselves or during a coughing episode. The sudden onslaught of a panic attack, especially if they are not regular to you, may be a sign you are having a heart attack. Beyond the University of Utah’s study, you may feel pain in your left shoulder due to the proximity of the heart to it. Usually a precursor to chest pains, you can suddenly feel a tightening in your chest and a lack of breath. An oncoming heart attack can cause you to feel nausea and light-headed. It’s also not unusual for it to cause stomach pain and upset stomach. Now that you have the major symptoms down, it’s time to figure out how important they are. The trick with heart attack symptoms is recognizing them for symptoms of a heart attack, and not confusing them with something else. But it must be stressed, if you think you are having a heart attack, get help immediately. Do not hesitate to call 911 or receive medical attention. In the case of a heart attack, the sooner you get help, not only are the chances of your survival, but also improve your chances of recovery. That being said, here are a few things to keep in mind regarding possible heart attack symptoms. Your left shoulder isn’t necessarily the harbinger of doom. While the University of Utah did note a connection between shoulder pain and those that are at a high risk of heart attacks, the shoulder pain isn’t necessarily because you are going to have a heart attack. The shoulder is a muscle. It can be strained, torn, and cramped. If you aren’t a high risk for a heart attack, or have any of those issues like high blood pressure and low blood sugar, a shoulder pain may just be that, a shoulder pain. Women should be more vigilant than men. Women are far more likely to have “silent” heart attacks than men, and she may not realize that she has had a heart attack. Heart attack symptoms in women should be taken seriously and checked out because of this. Regular heart attack symptoms should be taken serious, especially if they are combined with shoulder problems in the left shoulder and left arm. Finally, if you feel that you are having an immediate issue, you may want to seek medical help but by no means should you drive yourself. Call an ambulance or have someone else drive you to the hospital. The last thing you need to do when having a heart attack is have a car accident on top of that. Once upon a time, heart attacks were usually fatal. Doctors didn’t know how to treat them and by the time something had been figured out, it was often too late. Now, science not only knows how to deal with heart attacks, it has provided you with the tools for early detection. If you are at high risk of a heart attack and you start getting pain in your left shoulder—don’t dismiss it—go have it checked out. That trip to the doctor may save your life.